The digital knitting publication for the knitter seeking to bring more joy, healing, creativity, and connection into her life through the power and magic of her craft. connect us more deeply to the story of why we create. “Knitting is worthless and has no value. You should pick up a more useful hobby”. "Knitting isn't art. It's just a craft. Something cute and soft. Real makers and artists don't do crafts". It makes you want to hide your work in shame. When people ask you what your hobby is, you stutter and turn red in the face. You know all too well how knitting is perceived in society. Soft. Quaint. Domesticated. Feminine (and thus, undesirable). I’m passionate about creating meaningful and fulfilling work, shaking up the industry and fibre community, and serving as a catalyst for transformative impact. I’m on a mission to start a movement. I believe that our art and work as knitters can make a difference. Knitting is not just a hobby, but a form of art. It is a powerful medium for bringing more joy, healing, creativity, and connection to our lives… one stitch at a time. I want to challenge the norm that knitting isn't only soft, quaint, domesticated and feminine (as well as asking, "What's wrong with it being those things?"). Knitting is magical and impactful because of it's duality. It's quiet and loud. It's soft and rough around the edges. It's science. It's art. It's valuable and worthy simply because YOU made it. I’m here to show you how your passion for knitting can make a difference in your life and the lives of others. The Fibre Muse Quarterly focuses on telling stories to connect us more deeply to our narrative of creation through words, images, and designs, so you can create with intention and confidence (guilt-free), rediscover your pride in your work and articulate the worth of your art. Transmogrify your knitting into experiences and moments that bless and uplift yourself and others. Each issue of the Fibre Muse Quarterly is themed after one of the four Fibre Muses, which represents a reason for intentional creation for transformational impact. Mystic, the muse of self-care. Dreamer, the muse of self-expression. Seeker, the muse of self-discovery. Giver, the muse of selflessness. I've being designing knitwear since mid-2014, only a few months after I learn how to knit. It was an instant falling in love with the craft, and it gave meaning and fulfillment to my life. "Am I making a difference? How am I changing people’s lives with my work? It is worth me investing so much time and effort into a knitwear design business?" I want my work to make an impact on people. Or, as I’ve discovered through many sessions of reflection, talking it out, journaling, I want knitters to realize how their knitting makes an impact. To connect to it, to cultivate it to bring more joy, healing, creativity, and connection to their lives. I am passionate about catalyzing transformations through connecting knitters to their “why” (because I’m obsessed with digging into my “why”). Ever since the creation of the Fibre Muse archetypes, I knew I wanted to go deeper into the concept: to focus on each type, dedicate the time to exploring her magic and nurturing her spirit that lives in each knitter. And thus, the Fibre Muse Quarterly was born. We believe in collaboration over competition at Aroha Knits. That’s why I give every brand that played a part in the creation of the Fibre Muse Quarterly the space to share their story. May you find yourself inspired by their journey, resonate with their mission and purpose and connect with them and their work! 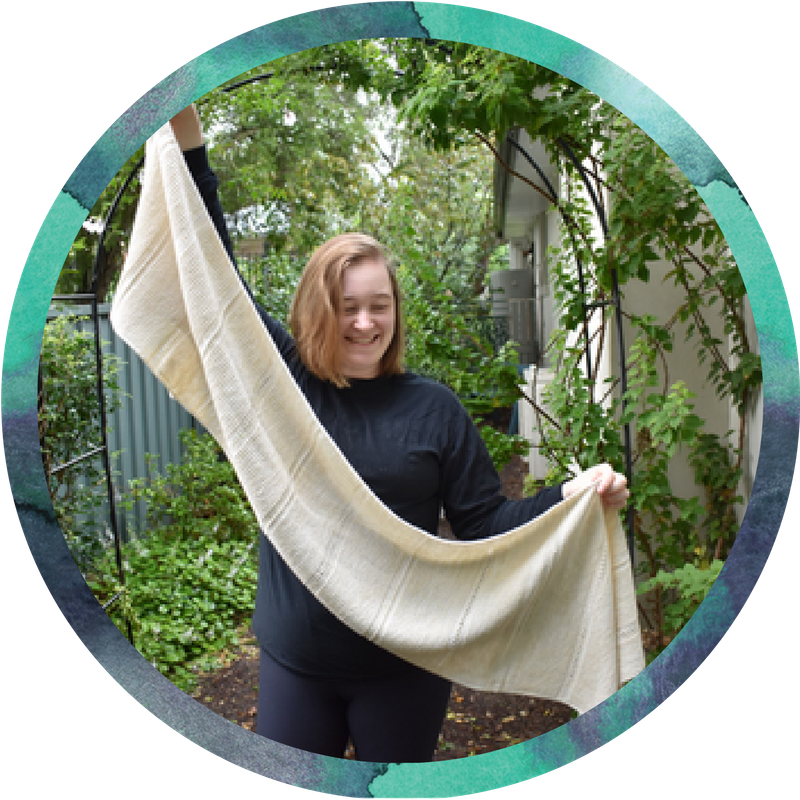 While the majority of the designs in the Fibre Muse Quarterly are designed by me, one or two of my SWATCH Studio students will be featured along with a pattern they designed for the issue. These interviews shine a spotlight on up-and-coming talents in the knitwear design community and to learn more about them and their mission via interview style. When I send out a call for articles, I ask my community first. Not everyone runs a business or is a designer, but I believe everyone has a story to share. The articles give Fibre Muses the opportunity to tell a fully-fleshed tale of why THEY create and how it makes an impact. They say that an image is worth a thousand words. The lookbook portion of the Fibre Muse Quarterly is one of my favourite sections as it uses rich visuals to tell a story. The lookbook is also a preview of the issue’s patterns and a visual representation of the Fibre Muse it is themed after. Each pattern has been intentionally created for the issue’s Fibre Muse and what would appeal the most strongly to her. For this collection, which highlights the Giver, these patterns focus on one-skein projects to be given as gifts, chunky and bulky knits for the winter season, in neutral colors for a soft, cozy vibe. The Fibre Muse Quarterly is ad-free and we intend to keep it that way. This is to keep the experience focused, without distractions. Why is the issue digital only? Is there a print version? At the moment, the Fibre Muse Quarterly is digital only. This was a conscious decision to put it all online as a way to minimize our carbon footprint and as a practicing minimalist myself, to prevent clutter. The patterns will be available as individual PDFs so you can print those out easily. There are plans to create a large omnibus volume at the end of the first four issue run, featuring the lookbook and patterns, focusing on the strong visuals of the Quarterly. What if I’m not a [x] Fibre Muse? Why should I get this issue? I believe that none of us fit perfectly into a box that someone else creates, not even me! So even though you may not identify as a [x] Fibre Muse, I’ll bet there’s a little bit of each Muse inside of you. So I think you’ll find that the patterns and articles inside this issue inspire that side of your personality, even if it’s not your dominant trait. Besides, what’s life without a little challenge? Just as I challenged myself to create this issue, I hope you’ll challenge yourself to do new things, and to discover truths about yourself that you may not have uncovered before. To see which patterns are in the issue, flip through the lookbook! Single patterns in the issue are released every couple of weeks after the initial launch of the full issue. This will also mean that the page for the design won't be up on Ravelry until that pattern's launch. This was an intentional decision in order to keep things focused. As the creation of each pattern in the issue was a collaborative effort between Aroha Knits + an indie yarn brand, I wanted to do separate releases for the single patterns themselves to not only highlight the story of each design but also the contribution and the story of the yarn that was used for it. It is part of our mission to shine a light on the hidden gems in the community and help them get the recognition they deserve. You can purchase the issue and get all the patterns and enjoy the content within upfront or wait for the pattern to be released onto Ravelry in the upcoming months. Want a peek at the magic inside? I happen to have been an art minor and was a recruiter for an art school for years. I wholeheartedly agree that knitting is fiber art and thus “true” art as well. I was taught that art is supposed to evoke a reaction and your’s definitely does that. You are the catalyst for change in this medium and I am glad I am witnessing it!!! … identify as a Mystic, Giver, Seeker or Dreamer. … want to learn how through intentional creation, you can create transformational impact. … want to bring in more joy, healing, creativity, and connection to a more happier, healthier and fulfilled you. … are a passionate knitter who believes that your craft makes a difference. … want to be part of a movement and community of Fibre Muses dedicated to making a difference. … see your knitting as just a simple hobby. … don’t want to make an impact and difference with their craft. … don’t care about diving deep into your story of intentional creation. … don’t believe in the transformative power of knitting. ARE YOU READY TO TRANSFORM YOUR YARN INTO MOMENTS AND EXPERIENCES? The featurettes in this issue will give you a behind-the-scenes look at the following amazing fiber artists and businesses: BigFootFibers, Harnie Hoolie’s, Round Table Yarns, Fiber Lily, Potion Yarns, and The Australia Wool Store. You’ll find three articles to help inspire your inner Mystic and recharge your inspiration. The Inaugural issue of the Fibre Muse Quarterly! The Seeker Fibre Muse uses knitting as a form of self-discovery and connection. We travel the world in this issue, featuring the stories of brands who focus on sustainability and ethical business practices, stunning imagery of Nara and Osaka, Japan, and evoke the spirit of this muse in the whimsical and minimalist designs. The Giver Fibre Muse uses knitting as a form of selflessness. The patterns were designed to be quick, one-skein knits to give as gifts during the holiday season, with some more time-intensive projects to treat yourself to, as extending that same selflessness to yourself isn't selfish! In the Dreamer issue, the patterns encourage you to play with bold colors and perfectly paired textures, to unleash your creative energy. This is your time to grab that variegated yarn you’ve been hoarding, or that treasured skein of handspun, and let your needles take you down paths of exploration and self-expression.